Most business leaders know that customer service and customer experience is often a key competitive advantage. But did you know the statistics and reality behind this? 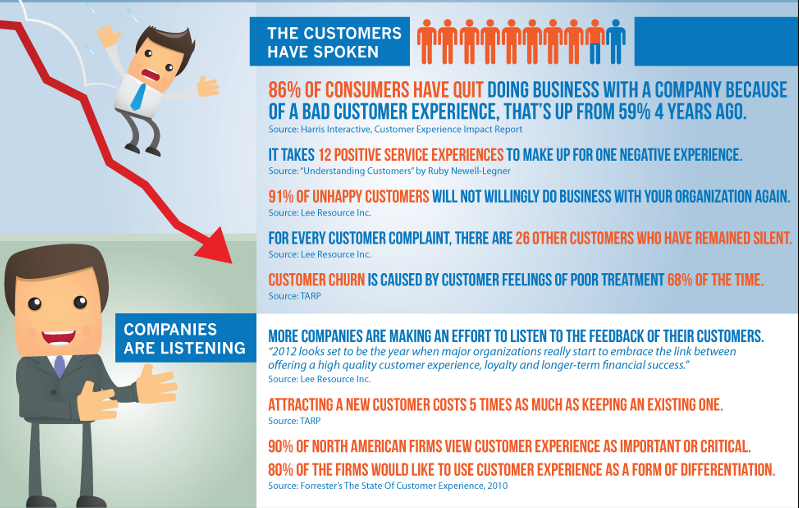 86% of consumers have quit doing business with a company because of a bad customer experience. That is up from 69% 4 years ago. It takes 12 positive service experiences to make up for one negative experience. Attracting a new customer costs 5 times as much as keeping an existing one. For every customer complaint, there are 26 other customers who have remained silent. Think about that for a second. You are only hearing from a small number of unhappy customers. What can you do to improve customer service in your business? It’s not enough to know the stats behind customer service. But what can you do about it? Here are a few ideas to focus on. Invest time in training your employees with most time spent on provi ding customer service. Yes they also need to know about your product or service but providing great customer service is the most critical aspect of training. Hire employees who are already great at customer service. It is much easier to teach someone about product knowledge than it is to train someone who not interested or can’t provide the customer experience you are looking to provide. Provide easy ways for your customer to provide feedback. Sure you’ll get a little feedback through online reviews like Yelp, Google and Facebook but really you hearing a small amount of feedback. 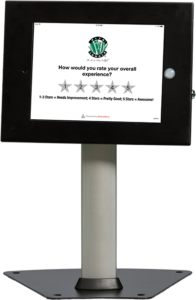 Considering using a service kiosk like ServiceGuru right at the point of service and you’ll get 50 to 100 times more feedback. Recognize employees who provide great service. Not only is recognition the top thing that keeps employees happy, it also helps to inspire other employees to provide great service as well. Speed to response of negative feedback is critical. Every minute and hour matters when you miss meeting or exceeding a customer service experience. When you get negative feedback get back to that customer immediately and make it right. This is especially important for online reviews since other customers will see how you handle complaints.